Special objective: To build capacity of poor rural communities, local citizens’ organizations, contributing to sustainable implementation of MDGs 1, 2, 3, 4, 7 by increasing awareness and commitment amongst decision makers in public, governmental sectors and civil society; establishing partnership and strengthening collaboration between stakeholders; advocating human rights, supporting women equal participation in rural development processes. Ecosan: The main objective related to ecosan activities in frame of ELA project was promotion of sustainable sanitation in rural areas. For this purpose AWHHE continued to monitor m aintenance of all toilets (3 school and 28 household toilets) constructed in the framework of ELA and TMF projects. Household toilets: During the monitoring of the household toilets attention was paid to the proper use and maintenance of facilities. Monitoring showed that out of 28 ecosan toilets 23 toilets were used by the households. Not using of the ecosan toilets was explained that they were constructed only for guests. The trainings on ecosan products usage were organized for the villagers in Hayanist. 10 households (45.47%) used ecosan produce as a fertilizer. Urine diluted with water was used by 6 households on average 2-8 times in total. It was used for potato, pepper, cucumber, egg-plant, bean, vegetable marrow and fruit-trees. No substantial difference in crop yield was noticed. Faeces were used by 4 households. The 2 of the households used it after composting: one simply composted the faeces but has not used it yet, and the other made compost using worms and currently uses it like biohumus. The other two households after keeping faeces for an appropriate period of time used it for garlic and pepper, but as the householders stated no significant changes in crop yield were observed. As a contribution to ecosan activity, salaries for maintenance of the school eco-toilets in Hayanist and Fantan are provided by the school administrations. Despite many householders had their contribution to construction of toilet at present they do additional works: facing, plastering, tiling etc. 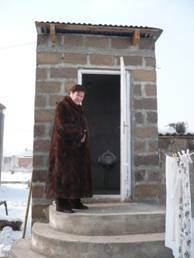 Eco-sanitation generated more demand for such toilets . Drinking water: The new water pipeline (length – 350m) is laid on in Hayanist and 20 households have access to drinking water. Out of the total cost 61% was the contribution of AWHHE and 39% in cash – local authorities. Construction of the new pipeline helped more families to have access to safe drinking water. 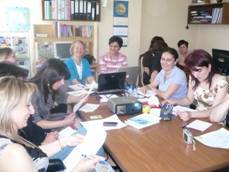 AWHHE jointly with WECF organized the training for teachers and AWHHE staff on WSP in May. As a result of the discussion with WECF 2 WSP small projects were developed for 2 village schools: Dzoraghbyur and Solak. 6 samples of drinking water for testing on presence of nitrates in water in 6 project villages were taken and tested. In addition during the organized training teachers were brought 3 water samples from each village (Dzoraghbyur and Solak). In 2 samples from Dzoraghbyur and Solak the amount of nitrates was above standard (more than 100 mg/l). AWHHE continuously carries out a visual monitoring of the water sources and quality of water from 6 villages. Mainly w ater from three sources in Dzoraghbyur permanently has had microbial contamination during the last five years. 47 samples of drinking water for microbial investigation were taken and tested in 2009. 16 samples (34%) did not meat national requirements for drinking water quality. Water samples have been analyzed by the Republican Center of Disease Control. Agricultural activities: Tree planting was organized in Solak village. On both sides of the road leading to the village 200 poplars were planted, and 40 poplars were planted in the school yard. Tree planting was organized also in Fantan school yard and yard of medical station. Altogether were planted 30 pear-trees and 20 apple-trees. The studies and monitoring conducted in the village Fantan showed that there was a difference in quality between the fertilized winter wheat and the wheat which was not fertilized with biohumus. There was also a difference between different sorts of wheat. The yield of fertilized wheat was 1.5 times higher the control version. 7 ha of winter wheat seed were sown in fields without mineral ferilizers in Khachpar, Solak and Kaghsi villages. In case of growing the sort of tomato “Lia” a special attention was given to the ecological and economic efficiency of replacement of mineral fertilizers with organic fertilizers. There were carried out field observations and laboratory studies for nitrates accumulation specificity, the average weight, acidity, N, P, K, vitamin C, soluble carbohydrates, common carbohydrates in one fruit. The best result was observed in versions that were fertilized with biohumus combined with manure. Certification of 2 organic orchards continued in the village Hayanist. Improvement works were done in the school yards of Solak, Kaghsi, Hayanist, Fantan and Khachpar. Benches were made and installed in villages. The orchard in the schoolyard of Hayanist school was replenished with 70 seedlings of “Sateni” apricot sort, 6,5 m long and 1m wide road lying between the benches was paved with tiles and Junipers were transported and replanted along the road. Plants’ protection activities continued to be conducted in the experimental orchards. Seven orchards in Hayanist, Dzoraghbyur and Solak were treated with herbal tinctures. To coordinate the agricultural activities in Kaghsi and Fantan were established agricultural centers. AWHHE provided these centers with spraying devices, dried plants for making tinctures, information materials and special films for dissemination. Each center has 10 members. Farmers used the biohumus produced by them in their fields. The farmer from Khachpar sold his biohumus to “Armenian Tree Project” and got an income. As a result of AWHHE campaign a farmer from Aknalitch village, who has got a 2 ha green house for tomato growing, managed to persuade the administration of nearby located Arzni cattle-breeding farm of engagement in biohumus production and sharing the biohumus with him. After they had consulted with our farmer, they started up the biohumus production. The farmer benefited much from selling 300 000 worms and providing consultations. AWHHE cooperated with ACDI VOCA organization that printed the brochure “Our Friend Compost” created by AWHHE for 22000 copies in order to distribute them among their farmers. 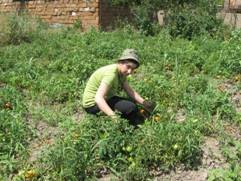 Together with ACDI VOCA organization AWHHE produced a short film named “How to make compost”. Energy: 3 solar water heaters were installed in Hayanist. The 3 households had their financial contribution which made 21% of the total cost. After the installation was completed, t he solar water heaters were handed over to the villagers. The agreements were signed. The main aim of these agreements is that the beneficiaries understand their responsibilities and become committed to manage and maintain the facilities. 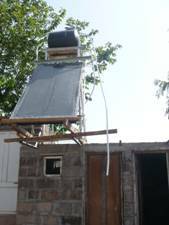 Experience in solar water heating for local dwellers: 3 solar water heaters were installed for 3 households (15 people) in Hayanist. As a result people have hot water for household and personal hygiene needs. Even water gets so warm, that the household users need to cool it before using. The neighbors (11 people) also use hot water for their own needs. Raising awareness activities: AWHHE conducted many educational and awareness activities. The main purpose of executed activities was to increase awareness about ecological sanitation, safe drinking water for all, sustainable agriculture and waste management and to get them interested in current ecological situation. Information materials including the already existing materials and new brochures and booklets were prepared, printed and disseminated. See sheet of publications. Lectures, trainings and workshops were conducted on health, sanitation, ecological agriculture and biodiversity for schoolchildren, teachers and local authorities. AWHHE widely uses mass media in its work. Articles were published: on drinking water, pesticid es issue, organic farming, waste and landfill of obsolete pesticides in newspapers and electronic newspapers. Capacity building of AWHHE: The ELA project led to increased capacity of organisation by sharing and exchanging lessons learned among other WECF organizations, building up knowledge, disseminating lessons learned at national, regional and international conferences. There is a clear increase in technical and management capacity of the organisation. Most notable was the increase in knowledge and skills related to ecological sanitation and water management. 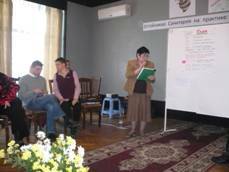 AWHHE actively participated in trainings on different topics organized by WECF in Georgia. Two main categories of activities are distinguished: the provision of physical facilities like drinking water piping and solar water heaters and awareness and advocacy activities. The implementation of organic agriculture is attractive and sustainable because it is implemented by farmers and therefore can be continued and expanded after project closure. Organic farming addresses actual environmental problems, and it also leads to increased income of the farmers. At the end of 2009, the certification process for two farmers have been in process. Ecological Sanitation provides an easy technology to reduce environmental pollution. Its implementation improves the state of groundwater and soil by reducing the anthropogenic pollution. Besides the nutrients are returned to the soil thus generating a nutrient close cycle. 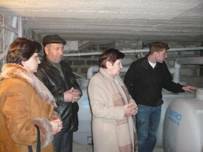 Interst by the government (Water State Committee) and NGOs also shows that the ecosanitation will be introduced widely in Armenia. Improvement of drinking water supply in Hayanist was one of the activities in 2007. The community of Hayanist asked to make an investment in water piping. A stronger sense of ownership and operation and maintenance resposibility were the keys for sustainability of the pilot. Positive experience encouraged AWHHE to continue and laid down pipes in new area of the village.